The World Cup tournaments of the 21st century do not possess quite the same unknown factor that those of yesteryear used to in unearthing breakout stars not known to most audiences. The end of the Cold War, the emergence of the European Union, the advent of the internet, the Bosman Ruling and unprecedented television coverage are just some of the many factors which means the emergence of a relatively unknown star at the tournament is unlikely. A journeyman like Roger Milla could once again turn some heads at a World Cup this summer with Serbia’s Aleksandar Prijović being a good surprise candidate. However, one player with the potential to dispel that is PAOK and Serbia striker Aleksandar Prijović who could be the Eagles leading man up front against Costa Rica in Samara on June 17. 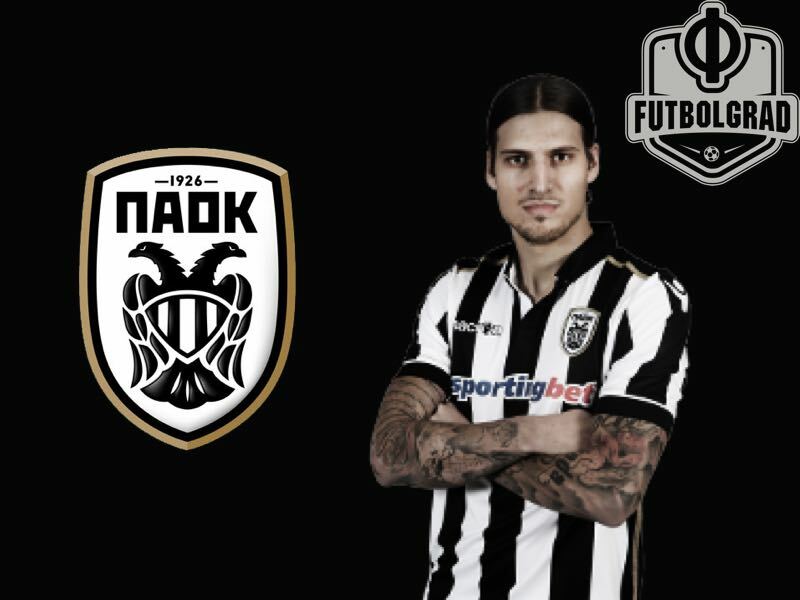 The 27-year-old is one of Serbia’s most in-form players and is a key part of PAOK’s assertion to the top of the Greek Superliga as Razvan Lucescu’s men look to break Olympiacos’ league dominance. The St. Gallen-born forward has netted ten goals in 17 league games this term and sits two goals behind Iranian Golden Boot leader Karim Ansarifard. Prijović is hitting peak form at the right time after a road less travelled path to the top following his move across the Swiss-Italian border to join Parma at 16. Having made his Serie A debut six days after turning 18, the Serbia-youth international rejected a contract extension from a club left reeling following their first relegation in 18 years. A move to another recently-relegated outfit in Derby County followed with Prijović impressing manager Paul Jewell following a hat-trick for the Rams academy side against Arsenal. However, Prijović’s time in the Midlands was forgettable with his debut delayed due to issues over his international clearance as Parma and the Swiss army sought compensation payments. The appointment of new manager Nigel Clough saw the teenager loaned to League One sides Yeovil Town and Northampton Town without making much of an impact as he experienced relegation once more with the latter. Unsuccessful trials in Germany and Denmark with Duisburg and Odense followed for the talent. A transfer back to his birth-country eventuated as he joined Swiss Super League side Sion in January 2010, a move which saw him ultimately switch allegiances and earn two U-20 caps for Switzerland. His time at the Stade Tourbillon was uninspiring, however, as he scored six times in 41 appearances for a club owned by one of football’s most controversial figures in architect Christian Constantin. Further loan spells with Lausanne-Sport and Norwegian side Tromsø – the latter following a recommendation by Ole Gunnar Solskjær – were also unspectacular. Tromsø manager Per-Mathias Høgmo saw things differently and signed the former Switzerland U-21 international following his appointment as coach at Stockholm-based side Djurgården. That move proved to be a watershed moment for Prijović who scored a hat-trick on his league debut and ended the campaign with ten goals in what was The Blue Stripes first season at the newly-built Tele2 Arena. With his stocks rising, the then 24-year-old made a surprise move to second-tier Turkish side Boluspor. Despite the perceived backwards step, Prijović excelled in Turkey as he netted 16 times in 31 league games for the mid-table side to finish one goal behind former Partizan star Lamine Diarra in the top goalscorer charts. The Polish capital Warsaw beckoned next for the striker who made Legia his tenth employer at the age of 25. His time under the tutelage of current Russia manager Stanislav Cherchesov at the Army Stadium projected his career to the next level as he won silverware following league and cup success. Prijović formed an elusive strike partnership with fellow Serb and Hungary international Nemanja Nikolic as the pair combined for a total of 36 league goals with the current Chicago Fire frontman winning the Golden Boot with 28 to his name. In the cup, he netted in the quart and semi-finals before being assisted by Nikolic in scoring the lone goal against rivals Lech Poznan to etch his name in Legia folklore. A late strike against Dundalk a few months later helped secure qualification for the Champions League for the first time since 1996. A double in the action-packed 8-4 loss to Borussia Dortmund at the Westfalenstadion was the highlight of his European campaign as momentum began to build for Slavoljub Muslin to cap the still-eligible Prijović for Serbia. Interestingly at Legia, the target-man was one part of a contingent of Serb players who had never been capped by Serbia. Nikolic made a name for himself in neighbouring Hungary and was a crucial part of their Euro 2016 squad while Bosnian-born duo Miroslav Radović and Stojan Vranjes were more celebrated in Poland and Bosnia. A €1.9 million move to PAOK in January 2017 quickly saw him become a fan favourite among the club’s ultras as netted seven times in 15 league appearances and help Vladimir Ivić’s side secure the Greek Cup – adding to his domestic cup triumphs with Sion and Legia. With the paperwork for a change of international allegiance completed and approved by FIFA, the 27-year-old made his debut for Serbia as a second-half substitute at home to Wales and made an immediate impact by skilfully assisting Aleksandar Mitrovic for the equaliser. Prijović’s rise from obscure journeyman to national hero was complete when Mitrovic returned the favour in the Eagles final World Cup qualifier against Georgia. With the hosts looking nervous throughout, a drive from the defence by captain Branislav Ivanović released the Magpies striker who hit the ball across cross goal and into the path of the oncoming Prijović. The forward made no mistake scoring the winner 13 minutes after coming into the contest as a substitute for Adem Ljajić, and provoke jubilant scenes across the Marakana. This month has seen Prijovic’s name continue to make headlines with purported interest from promotion-chasing Championship outfits Leeds United and Wolves, alongside French side Rennes. But for the first time in a while, Olympiacos’ seven-year domestic hegemony is under threat with PAOK and Prijović sitting at the summit of the standings and reluctant to sell their prized asset to potential suitors with the idea that a league triumph and World Cup minutes will only boost his price tag. Currently, he is Serbia’s most in-form frontman as Mitrović struggles for minutes at Newcastle and could well be tasked by new manager Mladen Krstajić of leading the Serbian frontline in Russia. If he does, it will cap off a remarkable transformation for the Zlatan of Serbia whose physical likeness to the Swedish superstar has seen him sometimes dismissed as the pound shop equivalent of Ibra. Whereas before he was a virtual unknown in Serbia, now he outranks namesake and famous pop singer Aleksandra as the country’s favourite Prijović. A date with the Swiss is also on the cards for a man who could well have been in Vladimir Petković’s plans this summer given the struggles of Haris Seferovic, Breel Embolo and Josip Drmić at club level respectively. From League One to the World Cup in just under a decade with a touch of cult hero status in Warsaw and Thessaloniki respectively makes Prijović an unlikely hero for Serbia heading into their first major tournament appearance in eight years. Back then he had his sights set on helping Switzerland qualify for the Olympics alongside the likes of Admir Mehmedi, Ricardo Rodriguez and Fabian Schär. This summer his task will be to be their nemesis and perhaps even emerge as the World Cup’s surprise package having forged much of his recent success away from the Western European limelight.